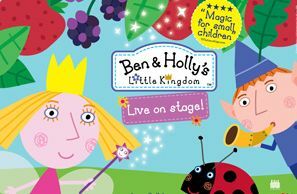 Holly is a young Fairy Princess, who is still learning how to fly and her magic doesnt always go quite according to plan. Her best friend, Ben the Elf, doesnt have wings and he doesnt do magic, but he runs very fast and flies on the back of Gaston the Ladybird. They live in the Little Kingdom, a tiny land where flowers and grass rise high above them and every day is an adventure.